We predicted that the USPTO’s new (2019) eligibility guidelines would have an effect, particularly at the PTAB (see here, here, and here). A new PTAB decision, designated as informative, is another data point confirming that direction. 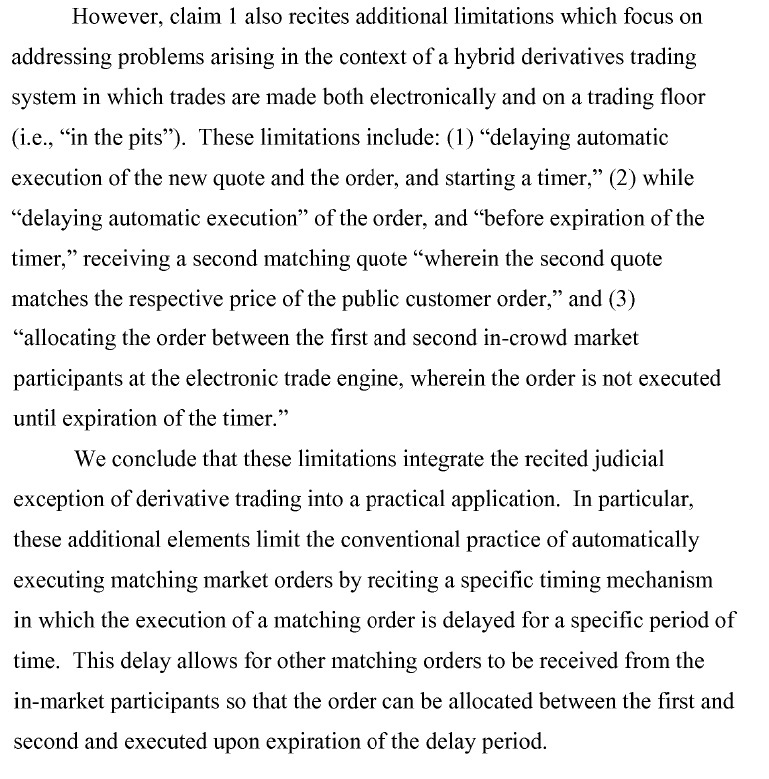 Ex Parte Smith relates to a method of trading derivatives in a hybrid exchange system. Those familiar with handling Section 101 rejections in the financial industry will recognize that if the examiner digs in their heels on a 101 rejection in this area, winning at the PTAB is somewhat of a long shot. But here, we see how that new phrase of the guidelines (whether additional elements integrate the judicial exception into a practical application) in the first step of the Alice framework can make a difference. As would be expected in art unit 3696, the examiner alleged this was a fundamental economic practice and mere data gathering and processing. The majority PTAB opinion (note there was a dissent filed) walks through the guidelines and first agrees that the claims recite fundamental economic practices and thus include a judicial exception. Importantly, the PTAB goes on to cite to the specification, which explains the purpose of the temporary restraint on execution being to allow a grace period within which the other in-crown market participant quotes or orders may be submitted at the best prices represented by the new quote. The specification further touted the advantage of this feature as encouraging more participants to quote at the best price and removing any communication or hardware advantage. Thus, the PTAB concluded that the use of the claimed timing mechanisms and associated restraints provides a specific technological improvement over the prior art. The dissent disagrees that the timing feature is technical, and alleges that it is a well known feature that would be appreciated by one skilled in the art. So, we see again that the PTAB is following the new guidelines, and the rearrangement of the technical problem/solution into the first step of the Alice analysis has real teeth.